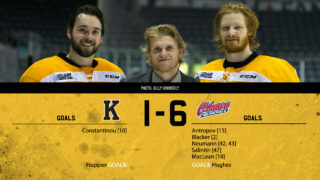 Kingston got off to a strong start in their last few games but struggled as the game went on. 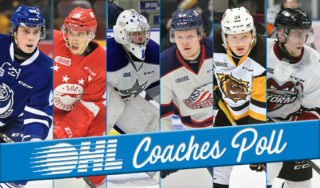 Things went differently on Friday night against their opponent, the Peterborough Petes. Peterborough scored the opening goal of the game on the power play when Nick Robertson picked a corner to beat Marshall Frappier. 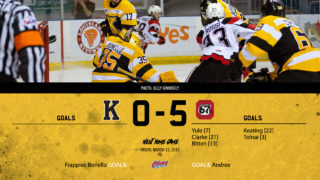 The Frontenacs bounced back nicely and Ryan Cranford tied the game after Tyler Burnie caused a turnover behind the Petes net. After an entertaining period, the Frontenacs and Petes were tied 1-1. 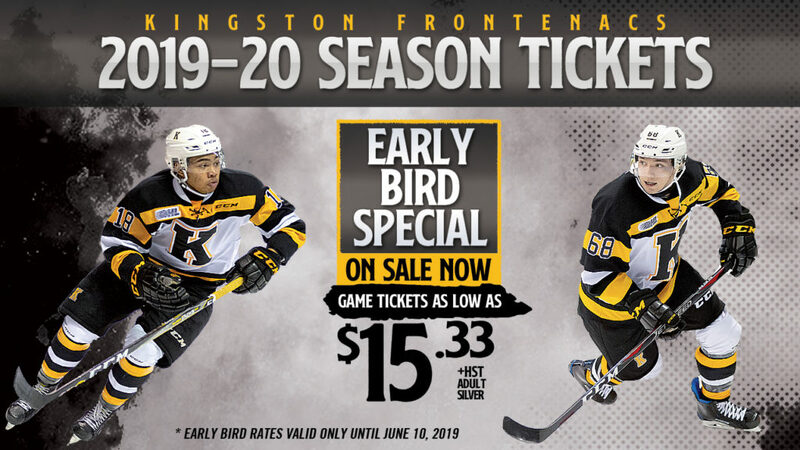 The second period may have been Kingston’s best of 2019. They drew penalties and capitalized on scoring chances. 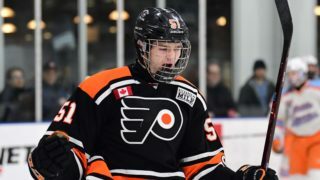 Dawson Baker gave Kingston the lead when he out battled a defender in front of the net a put a rebound by Hunter Jones. A second power play goal came six minutes later. 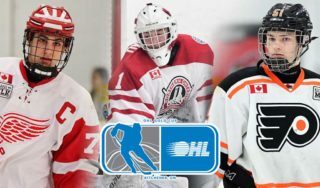 It appeared that Baker had scored his second of the game, but after further review the Petes defender knocked the rebound into his own net and Adrien Beraldo was credited with the goal against his former team. Marshall Frappier kept the Petes off the board in the period and Kingston took a 3-1 lead to the final period. 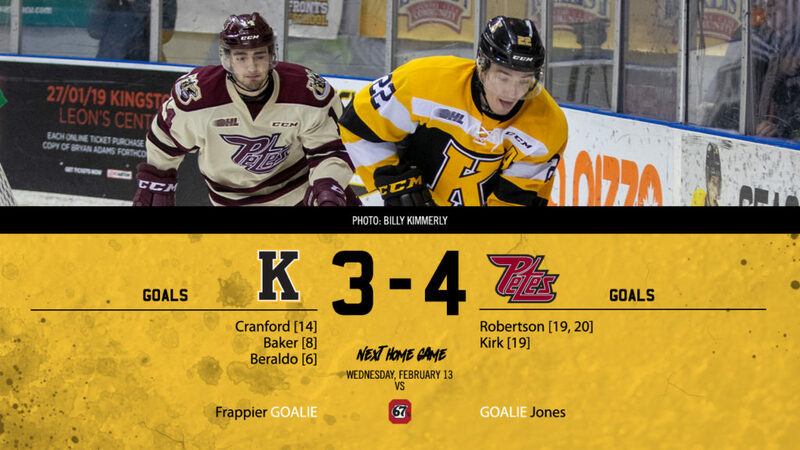 The Petes answered the Frontenacs strong second period with a strong third period. Nick Robertson got his second power play goal of the game off a one-timer from Ryan Merkley. They were buzzing from that point on. With under 3:00 left Liam Kirk scored the tying goal with Ryan Merkley recording his second straight assist. The buzzer sounded on the third period and Kingston went to overtime for the first time this season on home ice. 3 on 3 overtime created the usual excitement, but the goalies allowed nothing to get by them and it was off to a shootout. The first 4 shooters all missed on their opportunities. Brady Hinz was the first person to score for the Petes meaning Nick Wong was forced to score for Kingston. Hunter Jones got a big piece of the shot, but the puck snuck over the line and the shootout continued. Adam Timleck put the pressure on Kingston again when he scored as the next shooter. Billy Constantinou used a flashy move but missed the net with his shot giving the Petes a 4-3 win. Kingston had their best effort of 2019 and was nearly rewarded with a win. The Petes late desperation got them a win by the smallest of margins. After road games in Owen Sound and Guelph this weekend, Kingston returns home for a rare Wednesday game against the Ottawa 67’s. All walk up tickets for Wednesday’s game are just $14!